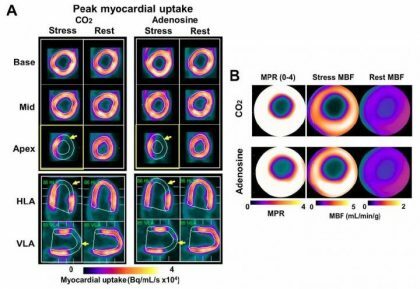 More than 5 million cardiac stress tests performed annually in the U.S. employ injectable forms of pharmacological stress agents — such as adenosine or one of its analogues — to dilate blood vessels in the heart. However, these drugs can have severe side effects. Using PET/MR imaging, a new international study featured in the June issue of The Journal of Nuclear Medicine demonstrates that increases in partial pressure of arterial carbon dioxide (PaCO2) can safely and efficiently widen blood vessels of the heart during stress tests to help determine heart function. Myocardial blood flow (MBF) is critical in determining heart function. While PaCO2‘s effect on MBF has been studied extensively in the past, previous findings have been inconclusive due to difficulty in quickly controlling PaCO2 to limit hypercapnia (too much carbon dioxide in the blood) and uncertain measures of the outcome variable. In this new study, these issues have been addressed. (3) pre-administered caffeine (which inhibits adenosine and can affect stress-test results). In all cases, PaCO2 proved just as effective at inducing MBF as the standard dose of adenosine and performs better than adenosine in animals pre-administered with caffeine.